Joachim B. Hansen (born 26 May 1979) is a Norwegian mixed martial artist. He began his career fighting for FinnFight before moving on to fight for Shooto where he became the first Scandinavian person to hold an MMA world title after winning the Shooto World Lightweight Championship in 2003 from Takanori Gomi. Hansen later fought for the Pride Fighting Championship and most recently Dream where he became the Dream Lightweight Champion after winning the Dream 5: Lightweight Grand Prix 2008 Final Round but then lost the title to Shinya Aoki at Dream 11. After a record of 19–9–1 Hansen suffered his first defeat by knockout to Japanese fighter Hiroyuki Takaya at Dream 14. Hansen was born in Oslo, Norway to a Norwegian father and Scottish mother. Aside from his career as a fighter, he has a job driving an oil tanker. Hansen's passion in martial arts began after seeing Jackie Chan films in his youth and he began training in Brazilian jiu-jitsu when he was 19 years old. He is good friends with former UFC veteran and Norwegian Brazilian jiu-jitsu specialist John Olav Einemo. Joachim "Hellboy" Hansen began his career fighting for Finnish promotion FinnFight before moving on to fight for Shooto's Finnish branch. His performance got him invited to Shooto's year-end show in 2002 where he, with a 3–1 record, faced Takumi Nakayama who at the time had 14 fights under his belt. Hansen won a majority decision. Hansen's performance impressed Shooto-veteran Rumina Sato who challenged Hansen after the match. Three months later the two met, with Hansen defeating the Japanese fighter two minutes into the bout by TKO. The win set him up for a title shot against the Shooto Lightweight Champion, and at the time 14–0, Takanori Gomi. The fight went the distance with Hansen being awarded a majority decision, making him the Shooto Lightweight Champion and first Scandinavian person to hold a MMA world title. Hansen's first title defense was against another undefeated fighter in Vitor "Shaolin" Ribeiro who took away Hansen's title by submitting him two minutes into the second round. Hansen went on to win his next seven fights, most notably against Gesias Calvancanti, Caol Uno, Masakazu Imanari and Yves Edwards, before losing a decision to Hayato Sakurai in the semi-finals of the Pride 2005 Lightweight tournament. He then challenged Tatsuya Kawajiri for the Shooto Welterweight Championship, but lost by disqualification due to a kick to the groin of Kawajiri. Hansen then went 2–2 in his next four fights, losing to Shinya Aoki and Eiji Mitsuoka, before his next big win against Kazuyuki Miyata at K-1 Premium 2007 Dynamite!!. On 15 March 2008 Hansen entered Dream's 16-man 2008 Lightweight Grand-Prix tournament. In the first round of the tournament he faced and defeated Japanese fighter Kotetsu Boku by unanimous decision at Dream 1. The win set him up for a quarterfinal bout against Eddie Alvarez, at Dream 3. Hansen and Alvarez were given a standing ovation for their "outstanding fights" by the entire crowd after their match. After a close fight Alvarez was awarded a unanimous decision and advanced to the Dream 5: Lightweight Grand Prix 2008 Final Round. The fight was described by MMAWeekly as "a fifteen-minute war" and that it would be a "fight of the year candidate", while Sherdog called it a "riveting 15-minute war" and an "epic battle". At Dream 5 Hansen defeated Kultar Gill in a reserve bout for the tournament. This became Hansen's ticket to the final after Alvarez, who went on to defeat Tatsuya Kawajiri in the semi-final, but was forced to withdraw due to a cut under his right eye. In the final, Hansen faced Japanese submission-specialist Shinya Aoki, who had previously defeated Hansen at Pride Shockwave 2006. In the fight Aoki used his grappling experience to try and submit Hansen after taking him down, but the Norwegian escaped and responded with powerful ground-and-pound which hurt Aoki and eventually forced the referee to step in. The win made Hansen the 2008 Dream Lightweight Grand Prix Champion and the first ever Dream Lightweight Champion. After the bout Hansen told the crowd he wanted his first title defense to be against Eddie Alvarez whom he replaced, and who had previously eliminated him from the tournament. Hansen's next fight was set to be against Gesias Calvancante at Dynamite!! 2008 on 31 December 2008, but the bout was canceled the day of the event due to Hansen not passing pre-fight medicals and subsequently being hospitalized for a "head injury". It was later clarified that the injury stemmed from a teammate landing awkwardly on Hansen's head after a takedown during warm-up, resulting with Hansen being rushed to the hospital where he was diagnosed with a concussion. In February 2009 Hansen was reported as being healthy and was in negotiations with Dream about his first title defense. His first title defense was on 6 October 2009 when he lost the title to Shinya Aoki. Hansen faced Bibiano Fernandes on 22 March 2010 at Dream 13 for the Dream Featherweight Championship. He lost the match in a split decision. Hansen defeated Hideo Tokoro on 25 September at Dream 16 with a Submission (Triangle Choke) 2:48 in the first round. Returning to Scandinavia, Hansen fought Usama Aziz at Superior Challenge 6 29 October 2010. Hansen defeated Aziz 3:47 in the second round by submission. Hansen fought Mitsuhiro Ishida on 29 May 2011 at Dream: Fight for Japan!. Hansen won via split decision. Hansen faced Tatsuya Kawajiri in a featherweight bout at Dream 17 at Saitama Super Arena in Saitama, Japan, on 24 Sept. He lost the fight via submission in the third round. Despite having an almost two-year hiatus, Hansen then faced Doo Won Seo (on a six fight winning streak) at ROAD FC 11 in Seo's backyard Seoul, South Korea. in which he defeated Seo via submission (arm triangle choke) at 2:24 into the second round. Hansen debuted as a professional kickboxer at the Shoot Boxing World Tournament 2012 in Tokyo, Japan on 17 November 2012. The Shoot Boxing World Tournament, or "S-Cup", is an eight-man, 70 kg standing vale tudo tournament that combines striking, throws and submissions held by the Shoot Boxing Association once every two years. He was drawn against Hiroaki Suzuki at the quarter-final stage and lost by unanimous decision after an extension round. In his sophomore apprearence as a shootboxer, Hansen gained his first win as he took a unanimous decision victory over Kenji Kanai at Shoot Boxing 2013 - Act 1 in Tokyo on 22 February 2013. Hansen has various tattoos. The tattoo on his right arm is an odal rune and it stands for spiritual heritage. The tattoo on his left arm is Viking art mixed with Celtic art. This relates to his bloodline as his grandmother is a descendant of a Scottish clan. On the inside of his left arm is Thor's hammer. Hansen enjoys heavy metal music and playing the guitar. 2nd place in European Cup (1999), 74 kg (163 lb) advanced division. 2nd place in BJJ Open in London (2001), 73 kg (161 lb) blue belt division. 3rd place in BJJ Open in London (2001), absolute/open weight blue/purple belt division. 2nd place in Helsinki Submission Wrestling (1999), 65 kg (143 lb) division. 1st place in Finnish Open (1999), 70 kg (154 lb) division. 1st place in Finnish Open (2000), 70 kg (154 lb) division. 1st place in Scandinavian Open (2000), 76 kg (167 lb) division. 1st place in Bad Boy Cup (2000), 70 kg (154 lb) division. 1st place in Finnish Open (2001), 79 kg (174 lb) division. 1st place in Frank Shamrock Invitational (2001), 70 kg (154 lb) division. 1st place in King of the Beach (2001), 78 kg (172 lb) division. 1st place in Scandinavian Open (2002), 73 kg (161 lb) division. Scandinavia Wrestling Submission Wrestling Champion (1999 and 2000). Loss 19–9–1 Bibiano Fernandes Decision (split) DREAM 13 22 March 2010 2 5:00 Yokohama, Japan For the DREAM Featherweight Championship. Loss 19–8–1 Shinya Aoki Submission (armbar) DREAM 11 6 October 2009 2 4:56 Yokohama, Japan Lost DREAM Lightweight Championship. Win 19–7–1 Shinya Aoki TKO (punches) Dream 5: Lightweight Grand Prix 2008 Final Round 21 July 2008 1 4:19 Osaka, Japan DREAM Lightweight Tournament Final; Won DREAM Lightweight Championship. Win 18–7–1 Kultar Gill Submission (armbar) Dream 5: Lightweight Grand Prix 2008 Final Round 21 July 2008 1 2:33 Osaka, Japan DREAM Lightweight Tournament Reserve bout. Loss 17–7–1 Eddie Alvarez Decision (unanimous) Dream 3: Lightweight Grand Prix 2008 Second Round 11 May 2008 2 5:00 Saitama, Saitama, Japan DREAM Lightweight Tournament Quarterfinal. Win 17–6–1 Kotetsu Boku Decision (unanimous) Dream 1: Lightweight Grand Prix 2008 First Round 15 March 2008 2 5:00 Saitama, Saitama, Japan DREAM Lightweight Tournament Opening round. Loss 13–4–1 Tatsuya Kawajiri DQ (kick to groin) Shooto: The Victory of the Truth 17 February 2006 1 0:08 Tokyo, Japan For the Shooto Welterweight (154 lb) Title. Loss 13–3–1 Hayato Sakurai Decision (unanimous) Pride: Bushido 9 25 September 2005 2 5:00 Tokyo, Japan Semifinal of Pride Lightweight Grandprix. Win 13–2–1 Yves Edwards Decision (split) Pride: Bushido 9 25 September 2005 2 5:00 Tokyo, Japan Opening Round of Pride Lightweight Grandprix. Loss 6–2–1 Vitor Ribeiro Submission (arm-triangle choke) Shooto - Year End Show 2003 14 December 2003 2 2:37 Chiba, Chiba, Japan Lost Shooto Welterweight (154 lb) Title. Win 6–1–1 Takanori Gomi Decision (majority) Shooto - 8/10 in Yokohama Cultural Gymnasium 10 August 2003 3 5:00 Yokohama, Japan Won Shooto Welterweight (154 lb) Title. 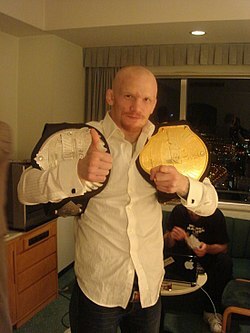 ^ a b c d e f "Sherdog Fight Finder – Joachim Hansen". Retrieved 29 December 2008. ^ a b c "K-1 Fighter Profile". Archived from the original on 22 December 2008. Retrieved 29 December 2008. ^ "Hiroyuki Takaya scores Dream 14 knockout of Joachim 'Hellboy' Hansen". USA Today. 29 May 2010. ^ a b c d Leidecker, Tim (22 July 2008). "There at Last: The Career of Joachim Hansen". Sherdog.com. Retrieved 25 February 2009. ^ O'Regan, John (29 August 2008). "Exclusive: Joachim Hansen living the Dream". fightersonlymagazine.co.uk. Archived from the original on 18 September 2008. Retrieved 29 December 2008. ^ "Dream.3 Lightweight Grand Prix Second round Results and Recap". fighting-mma.com. Retrieved 29 December 2008. ^ a b "Dream 3 REVIEW: UNO AND ALVAREZ VICTORIOUS". MMAWEEKLY.com. 11 May 2008. Retrieved 29 December 2008. ^ "Post-Dream Notebook". Sherdog.com. 13 May 2008. Retrieved 29 December 2008. ^ a b c "Hansen Exacts Revenge, Claims Dream Title". MMAWeekly.com. 21 July 2008. Retrieved 29 December 2008. ^ a b "'Hellboy' Gives Dream GP Alternate Ending". Sherdog.com. 21 July 2008. Retrieved 29 December 2008. ^ Loiseleur, Tony (31 December 2008). "K-1 'Dynamite 2008' Play-by-Play from". Sherdog.com. Retrieved 25 February 2009. ^ Leidecker, Tim (6 February 2009). "Update: Hansen Healthy, Management Negotiating with FEG". Sherdog.com. Retrieved 16 February 2009. ^ "Bibiano Fernandes vs. Joachim Hansen confirmed for Dream 13". fiveouncesofpain.com. Retrieved 28 January 2010. ^ "Three Fights Added to DREAM.14". headkicklegend.com. Retrieved 23 April 2010. ^ ""DREAM.17: Fight for Japan" adds Hansen vs. Ishida". mmajunkie.com. Archived from the original on 3 November 2011. Retrieved 25 April 2011. ^ "Bantamweight Pairings Announced for Grand Prix at Dream 17". MMAWeekly.com. 5 August 2011. Retrieved 5 August 2011. ^ ""Hellboy" Hansen puts Seo to sleep at Road FC 11". mmaviking.com. 13 April 2013. Retrieved 30 June 2013. This page was last edited on 8 March 2019, at 17:35 (UTC).